Cruzan Rum will lose millions of gallons of bulk rum sales, costing the territory millions of dollars in cover-over federal excise tax revenues, unless the territory increases cash subsidies to match Puerto Rico, Cruzan’s corporate owners and administration officials told the Senate on Friday. The Senate met in Committee of the Whole in Frederiksted to hear testimony on a Gov. John deJongh Jr. proposal to modify the government’s agreement with Cruzan to match Puerto Rico. This is the third increase in V.I. government cash subsidies to the rum company since 2009. The V.I. government penned an agreement with Cruzan in 2009 dedicating remitted rum tax revenues to pay for bonds to expand Cruzan and build a wastewater treatment plant, and setting up a schedule of gradually declining subsidies, starting at 40 percent of bulk rum-related revenues and then dropping to 18 percent. 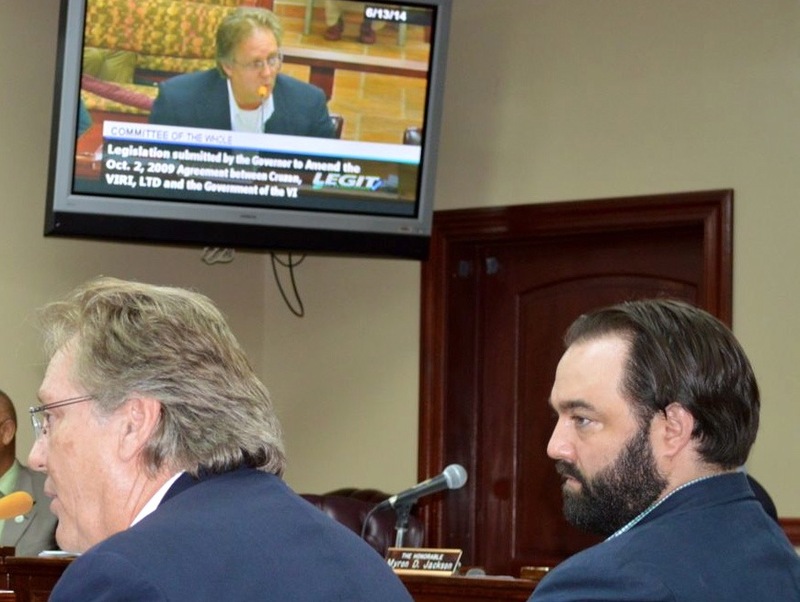 In 2012, deJongh proposed – and the Legislature approved – keeping it at that level, and Cruzan Rum President Gary Nelthropp testified that Puerto Rico was subsidizing its rum producers at 25 percent, and if the territory did not immediately match that level of cash infusion, Cruzan would lose sales and the territory would lose revenue. Nelthropp returned Friday and made essentially the same case, saying Puerto Rico was subsidizing its rum producers more, so the territory needed to match it or Cruzan would go under. “We – Cruzan and the U.S. Virgin Islands – have lost over 6 million proof gallons of annual rum production to Puerto Rico in just over two years. By offering superior incentives to its producers, Puerto Rico is reaping the rewards of Cruzan’s former business as we speak!” Nelthropp testified. "This is revenue that should be going to the Virgin Islands but, because Puerto Rico has moved aggressively and quickly to offer more favorable terms to their bulk rum suppliers, Cruzan cannot compete and generate cover over revenue, the majority of which would go to the territory," he said. “If this disparity is not remedied and if changes are not made to our current agreement, Cruzan Rum will not survive," he said. V.I. Management and Budget Director Debra Gottlieb similarly sounded the alarm that Cruzan is bleeding badly and needs help now. Gottlieb said Puerto Rico producers have benefited from a 2011 Puerto Rico statute that allows the government to increase the level of support to 46 percent upon a “finding of necessity” by the governor of Puerto Rico. Sen. Nereida "Nellie" Rivera-O’Reilly said the Puerto Rico law only allows 46 percent subsidies with an executive order, but she could not find any. "We have looked and not found such an order," responded Peter Hiebert, an attorney with the firm Winston and Strawn, a law firm that advised the V.I. government on trade issues. Jared Fix, a vice president with Cruzan’s parent company, Beam Suntory, cited the loss of the rum sales as evidence of Puerto Rico’s action. "The fact that they left, it points to an enhanced subsidy level," Fix said. Senator after senator said they did not like increasing subsidies but believed it was necessary to keep Cruzan competitive. "If we fail, Cruzan does not survive," said Sen. Donald Cole. Sen. Judi Buckley said, "I too regret we have come to this but I recognize the importance of it." Sen. Tregenza Roach said he would like to see the measure amended so the Legislature is notified before, rather than after, the governor increases a subsidy. No votes were taken. The proposal will be addressed during a legislative session scheduled for Wednesday. Present at Friday’s hearing were Cole, Buckley, Roach, O’Reilly, Sens. Craig Barshinger, Diane Capehart, Kenneth Gittens, Alicia "Chucky" Hansen, Myron Jackson, Shawn-Michael Malone, Terrence "Positive" Nelson, Sammuel Sanes and Janette Millin Young. You can thank Gov. John deJongh Jr. for this mess that he has created.